If you follow my blog then you will know that I have recently developed a more than mild obsession for Paige Toon's books. Johnny Be Good was the first to arrive following a post Thirteen Weddings Amazon frenzy and it was quickly devoured, so here I am attempting to write another review. When I first picked it up I thought it was just a stand alone book, I then found out that it was followed up by Baby Be Mine, Johnny's Girl and The Accidental Life of Jessie Jefferson. I am not usually someone who cares whether a book is a series or not, in fact I quite enjoy stand alone books because they allow you to carry on the story in your own mind, but after reading Johnny Be Good I was glad that I could go and gorge on a couple more- and of course that is exactly what I have done! Reviews of Baby Be Mine and Johnny's Girl to follow! So, lets start with the character of Meg, I warmed to her quickly, I found her to be witty, smart and likable and a brilliant contrast to the carefree Johnny. I have to admit that I too fell for the completely unsuitable Johnny, maybe because I saw him through Megs eyes? What I have noticed with Paige Toon books is that I always feel as though I am living the story too, watching the crazy world so clearly through the eyes of Meg, my views were therefore hugely influenced by her, my love for Johnny fluctuated with hers- which was a common occurrence because of his unsuitable lifestyle and the alternative love interest in the form of entirely more suitable Christian. This is the third Paige Toon book I have read and what I love is that the love interest isn't always clear cut, I found myself switching loyalties throughout the book and even though in a sense it was a typical love story, it didn't have a simple linear story line and there was a sense of unpredictability that left me guessing right up till the last word and left me excitably reaching for Baby Be Mine. I hate nothing more than a book that zones in on just the lead characters and I felt that Paige Toon gave plenty of attention to the more minor characters. There is Christian, Bess and Kitty to name a few and I felt as though plenty of attention was given to them to set them up as realistic and well rounded characters. The only criticism I have is that I felt that Meg fell too easily in love with Johnny, I would have liked it if their conflicting personalities could have been used a bit more at the start of the book. I wouldn't hesitate to recommend this book, another brilliant offering from Paige Toon with the added advantage that if you love it, the story of Meg and Johnny carries on into Baby Be Mine. 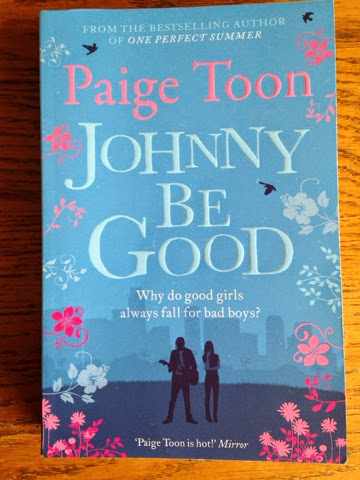 You can pick up Johnny Be Good from amazon and you can find out more about Paige Toon on her website.